Barack Hussein Obama will put America behind the struggle to end the civil war between Sunni and Shia Muslims. 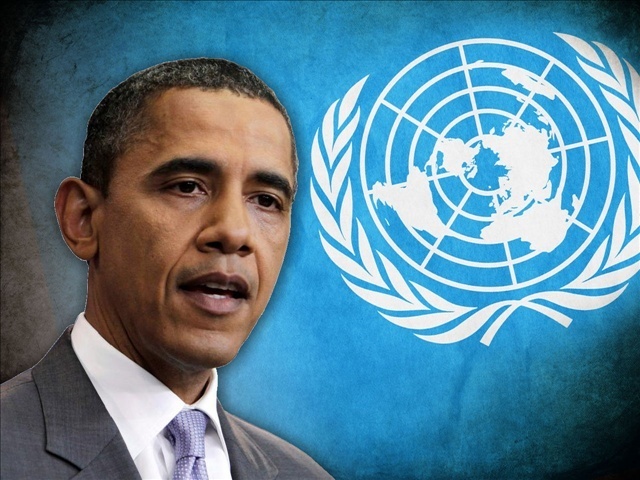 Barach Hussein Obama presented Islam as a global “peace movement” from the pulpit in the United Nations. ” It is time to acknowledge the destruction wrought by proxy wars and terror campaigns between Sunni and Shia across the Middle East. And it is time that political, civic and religious leaders reject sectarian strife”. There is nothing new about wars within religions. Christianity endured centuries of vicious sectarian conflict. Today, it is violence within Muslim communities that has become the source of so much human misery. So let’s be clear: This is a fight that no one is winning. A brutal civil war in Syria has already killed nearly 200,000 people, displaced millions. Iraq has come perilously close to plunging back into the abyss. The conflict has created a fertile recruiting ground for terrorists who inevitably export this violence. It must be painful for Obama, to se his Muslim brothers killing each other. This is not the way Obama want to present Islam. The political elite of the World are ready to form a new One World Government. The only stumbling block towards World Peace, is Shia and Sunni Muslims continue fighting each other. And of course the stuborn Zionists in Israel. When Obama underline that “Islam stands for peace”, the US president speaks about his own Islamic convictions. What Obama calls “true Islam”. Hussein Obama see so many positive signals from the Muslim World. Like “Peace in Tunisia”, “good governance in Senegal”, and even “true democracy in Indonesia”. To bring us all into the One World Religion, we must accept that people might pray to “any god”. Surely, as long as no one claims that Jesus the Messiah is the only God who can save you. Such a view will soon be branded as extermeny intolerant and a criminal isult against “the prophet”. We must be as Bereans, checking all things we hear and read with scripture. AND reading between the lines, pray for Godly wisdom and discernment understanding that what is being said is not always the truth, but a shrewd move to manipulate and deceive. Get ready church and be prepared. – our best days are just ahead. The real Muslims are ISIL and others like them. They are following what Muhammad did. Islam is an antichrist religion. I suspect we are seeing a major move in Satan’s strategy to bring the final False Prophet of Islam together with the Antichrist and his world government. Islam needs to be united under one banner for that False Prophet to rule over all. This latest upsurge in Middle Eastern war is resulting in a unity among Islamic states unseen before now. The recent financial warfare employed by the West against Russia is an Antichrist government development in line with Revelation 13:16-17. The prophetic pieces are falling into place! There is only one religion according to the Bible. People need to be spiritually reborn through Jesus and then follow the pure religion by witnessing to others and not living worldly.